Yikes! Oh! It's y-you! Sorry I f-f-freaked out like that! You just s-startled me! Well anyway, this t-trope is n-not to be confused with n-n-n-nightmare fuel, which is a popular page that describes various audience reactions, which also scares me! ; nor tropes used in FEAR, though a few below are; nor The Fear Index, even though this is one. Compare Horror Tropes, Anxiety Tropes, Weakness Tropes, those really make me feel uneasy! Contrast Bravery Tropes; oh how I wish I was one of those! All these tropes are really scary! Let's hurry up and get this over with! I'm not sure how long I could sit through these! Yikes! These tropes are way too scary! Absurd Phobia: I'm scared of something even if it doesn't even make any sense! Acrophobic Bird: I'm a bird who's scared of flying! Adult Fear: Oh my God!! This has truly scared me! It's all so real that it's able to genuinely scare a mature, sensible adult like me! Afraid of Blood: Yikes! Blood! Afraid of Doctors: Help! The doctor's about to get me! Afraid of Needles: Somebody save me from those sharp, pointy things! Afraid of Their Own Strength: I'm scared of my own powers because they could hurt or kill people! I'm also a pacifist. Anger Born of Worry: How dare you put yourself in danger! I was worried sick about you! Anxiety Dreams: I just had the worst nightmare about something I feared in real life! Appeal to Fear: I have to agree, because if I don't something terrible might happen! Author Phobia: Yikes! This story that I wrote just scared me! Bat Scare: Help! Flying bats! Bring My Brown Pants: Yaaaaiiiiiii!! Oh great! I just soiled myself! Cathartic Exhalation: *takes a deep breath* Whoa! That scary thing nearly took my breath away! Cat Scare: Aaahh!! Oh! It's just a cat. C.A.T. Trap: NOOO! I hate cat scans! Claustrophobia: Please don't close in on me! I get really nervous of closed spaces! Cowardly Lion: I'm scared of fighting! But I guess I have to do it anyway! Cowardly Mooks: That hero just beat up one of our virtual villain comrades! Please don't hurt me! Cowardly Sidekick: I'm so afraid! At least I have the hero as my partner! Cower Power: I'll just hide behind someone else to protect myself! Daylight Horror: Help! Evil is lurking in the morning sunlight! Deep Breath Reveals Tension: *inhale, hold, exhale* I'm calm. *inhale, hold, exhale* I am calm. Deer in the Headlights: I'm too afraid to move! Defanged Horrors: We're children! So all those things scares us more than the adults! Delayed "Oh, Crap! ": Someone told me something scary! That means I'm doomed! Dirty Coward: I'm too afraid to save anyone else! I just want to save only myself because that's safer! The Dreaded: I'm a villain! Everyone fears me! Eldritch Abomination: Oh my god... what the hell is that weird, creepy thing?! Face Your Fears: I'm scared of that thing! But it's time for me to face it like a man! Fake Kill Scare: No! Someone just got killed! Hey! Wait a minute! That was fake?! Fear Is the Appropriate Response: I'm the hero! But I'm too scared to fight! Fear of Thunder: Yikes! A thunderstorm! Fearless Fool: Pffft! I ain't scared of that thing! I'll take on it no matter how stupid it is of me! Fearless Undead: I'm the The Undead! I don't get scared that easily! Fearsome Foot: Help! A scary guy's foot! Flat Scare: Yikes! Someone just shouted "Boo!" in a flat tone in my face! Fright Death Trap: Help! A murderer tried to kill me by literally scaring me to death! 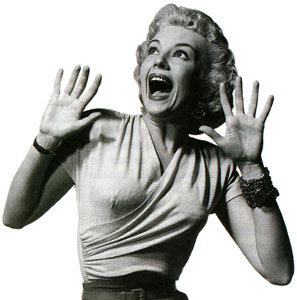 Girls Are Really Scared of Horror Movies: I'm a woman, and I hate horror films! They're too scary for me! Hope Is Scary: Oh dear! My hope is scaring me! Horrifying the Horror: Yeah, I'm scary, but that thing is scaring me! "I Can't Look!" Gesture: I can't look! I'm too scared! I Know What You Fear: Great! Someone's gonna use my fear against me! I fear they're gonna tell everyone! The "I Love You" Stigma: My greatest fear is using the word "love" to express my affection to another person! I really fear romance! I'm Not Afraid of You: Please! You can't scare me just because you rely on fear! Ironic Fear: I got the abilities/species/job/etc. of something that I'm scared of! Now that's scary! Kids Shouldn't Watch Horror Films: Help! My parents were right! I'm too young to be watching horror flicks! Knees Knocking Together: My limbs are shaking! I'm scared now! Lovable Coward: I'm scared! But that's why so many people love me! Miles Gloriosus: Okay! I admit it! I'm no daredevil! I'm really a fraidy cat! Mirror Scare: Aaahh!! A reflection! Missing Child: Oh my God! My child is lost! I'm very scared! The Mob Boss Is Scarier: Help! A criminal! Mortality Phobia: I'm scared to die! Motivated By Fear: I'm afraid of this thing! But that's what motivated me! Nervous Wreck: Oh my God! I'm starting to become very nervous! Somebody please help me! I don't know what to do! Neverending Terror: Help! I'm in danger forever! Not Afraid of You Anymore: You have mistreated me for the last time! I no longer fear you! Not Afraid to Die: Go ahead! Kill me! I ain't scared to die! Nothing Is Scarier: There's nothing scarier than something I can't see! That's my biggest fear of all! Oh, Crap! : Oh no! I'm doomed! "Oh, Crap!" Fakeout: Oh no! I'm doomed! Wait! This was a fakeout?! "Oh, Crap!" Smile: I'm smiling out of realizing I'm in a pickle! One Episode Fear: I'm scared of that thing! Because the script said so for only this episode! Orphanage of Fear: I'm afraid of this orphanage! My parents were never this cruel to me like these "guardians"! Outscare the Enemy: Yikes! That hero is even scarier than me! Panicky Expectant Father: My wife's in labor! I'm starting to feel nervous! Paralyzing Fear of Sexuality: I'm not asexual, but I'm very nervous to lose my virginity! Paranoia Gambit: Oh my God! I'm starting to feel nervous! Someone help me! Wait! That person didn't actually do it?! This was all a way to make me feel scared for nothing?! The Paranoiac: Stay away from me! I don't trust anyone or anything! Improperly Paranoid: What do you mean, I'm scared for no good reason?! Properly Paranoid: I knew it! I told you I had an excellent reason to be nervous! Performance Anxiety: I can't perform! I get stage fright! Pregnancy Scare: I might be pregnant! I'm starting to become nervous! I'm not ready for child birth! Previews Pulse: Yikes! That chord playing in the trailer just scared me! Primal Fear: This scares us all out of instinct! Rule of Scary: I don't care if it doesn't make any sense! It still scares me! Scare Chord: Aaahh! That music was the perfect chord to demonstrate my reaction! Scare Campaign: Help! This political ad has convinced me the other one is scary! I'm staying away from it! Scare Dare: O-okay! I g-g-g-guess I'll d-d-do what I was d-d-d-dared to! Scared of What's Behind You: Good! I scared that person away! (feels tap in the shoulder) Yikes! Scare 'em Straight: This person just got me to do something by scaring me! It could happen if I don't comply! Scary Shadow Fakeout: Help! That shadow's moving! Scary Teeth: Uh oh! That guy's teeth is really scaring me! Screams Like a Little Girl: Aaaaaaahhh! Okay, tell anyone that my scream sounded girly, and you're dead! Security Cling: Help! I have to grab onto my partner because I'm so scared! The So-Called Coward: They think I'm a coward, huh?! Well, it time for me to refute them! Supernatural Fear Inducer: Yaaahh! A supernatural power is scary! Tears of Fear: I'm afraid! These tears I have in my eyes show this! Technophobia: No! Contemporary technology scares me! Terrified of Germs: Help! Germs! Sick disgusting germs! The worst thing to have around me! Terror Hero: Great! That hero is taking advantage of my fear! Why did I, a villain, have to be scared in front of him?! Things That Go "Bump" in the Night: Help! Monsters! I can hear them bumping in my bed! And now in my closet! Hell they're everywhere! Victory Through Intimidation: We can't fight! We're all too scared! The Villain Knows Where You Live: Help! The villain is everywhere! He found out where I live! "What Do They Fear?" Episode: Why are these people trying to find out what I fear?! They're wasting their time! (in the end) Yikes! They actually found it! Why Did It Have to Be Snakes? : I got a specific fear that I'm too scared to talk about! Wide Eyes and Shrunken Irises: My eyes are bulging in fear! My irises have also shrank! Worrying for the Wrong Reason: I'm starting to feel worried! Wait! Are you telling me to worry about something else?! You Can Panic Now: Aaaaahhh! These media articles scare me! Your Worst Nightmare: How did that villain get into my nightmares?! I'm even more scared!